In France, we have a tradition in january. We eat pastry called Galette des Rois. This delicious cake is done with flaky pastry and frangipane. 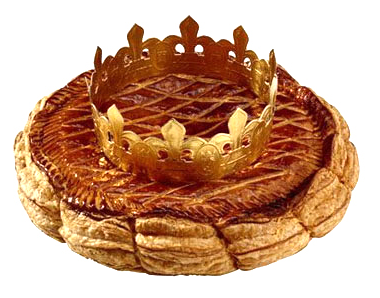 We put a lucky charm or token made of porcelain and we hide it in the "galette des Rois". The youngest at the table, which is supposed to be the most innocent, goes under the table and choose which piece of galette is for who. The one who find the token is the king or the queen. He is then supposed to choose someone at the table to share the power with him, who will become a king or a queen too. They recieve a little crown, and the game can begin... Is it an absolute monarchy or a parlementary monarchy? Roll out a flaky pastry on a plate. Pierce it everywhere with a fork. Melt all the ingredients together (unless the egg yolk). It is the frangipane. Put the frangipane and the lucky charm on the pastry, and cover with the other flaky pastry. Close the edges together. Pierce the pastry on top otherwise it will blow up and become dry. Spread the egg yolk on top of the galette. It will glaze the pastry. Put it in the oven at 210°C (410° fahrenheit) for 30 minutes (between 25 and 40 min).